As we approach the end of the season and indeed this regulation set it became apparent that it would be better to combine the technical content of these two races. Red Bull headed to the Indian GP with what was almost an unassailable lead but continued to demoralize their opposition. Although the team could get the party started with Vettel helping himself and the team to their 4th consecutive championships, Mark Webber once again felt the wrath of an alternator failure which ended his GP early. Vettel started the race on the Option tyre and even though many of us had predicted a short opening stint, none of us were brave enough to venture that he would dispatch of the tyres quite so early. 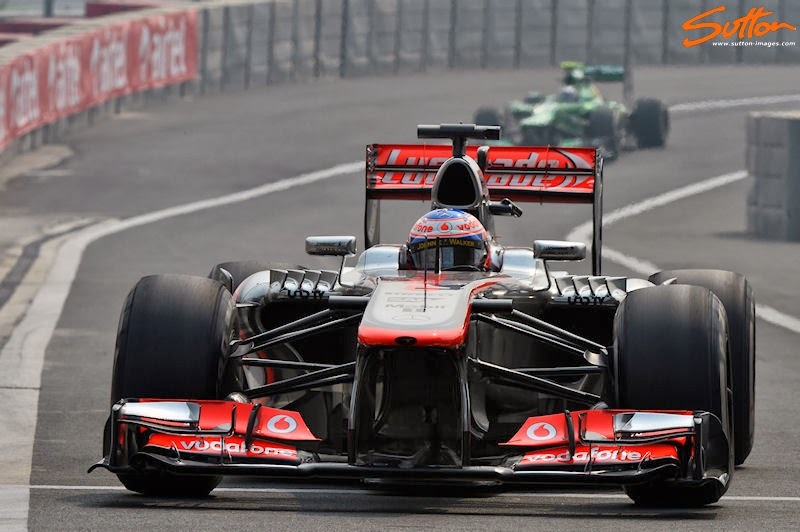 The approach was mirrored by Webber who also ran a very short (3 lap stint) on the Option tyre signalling Red Bull's clear dislike of the option tyre around the Buddh International Circuit. The team are clearly leaps and bounds in front of the rest of the field in terms of performance and have even taken to running much less rear wing over the last few races to yield a higher top speed through the traps. This however hasn't stopped the team from developing the car with the team taking further parts to each GP. In India they tested a new pair of Vertical Strakes behind the Cascade replacing the straight versions with a pair of triangulated versions. My friends at Sutton Images didn't manage to get a shot that weekend so I produced this drawing to illustrate it. 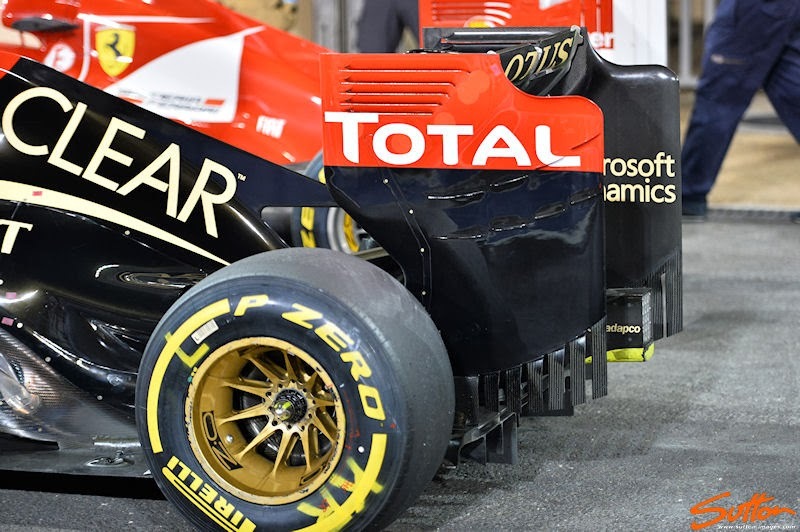 However the time on the car during Free Practice proved enough for it's inclusion on both car's at Abu Dhabi. 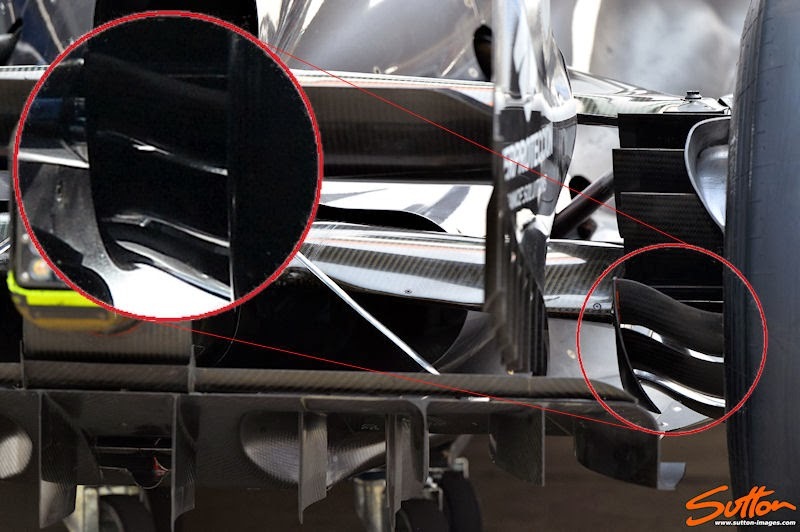 For anyone unaware of their purpose, these strakes create a vortice that has an onward effect on controlling the airflow around the front tyre. Mercedes now find themselves in a dog fight til the end of the season with Ferrari for 2nd place in the constructors championship. You may say 'But who cares? ', well it's a fairly large deal, not only is there the obvious adulation of besting their opponent but also prize money and perhaps most importantly the allocation of the 2nd pit lane garage next season. The problem for both teams now though is that with the Championship done Red Bull can afford to switch off development for 2013 and instead actually even consider developing and testing concepts with an eye on 2014. Mercedes seem to have conceded that they too cannot afford to focus further development on 2013 and have instead been focusing on setup and tyre management. They have also taken to using DRD (Drag Reduction Device) during the initial setup phase, likely to gain a lap delta from which they can extrapolate a setup conducive for use in both qualifying and the race. However there is something to be said in that it's application might still be viable for 2014 (I'll cover this in the forthcoming 2014 articles). Ferrari have spent the last two races doing much the same as they have for the rest of the season, getting lost in the wilderness. The team returned to the use of the Rear Wing endplates last saw on the car back in Silverstone which feature a tyre wake slot. 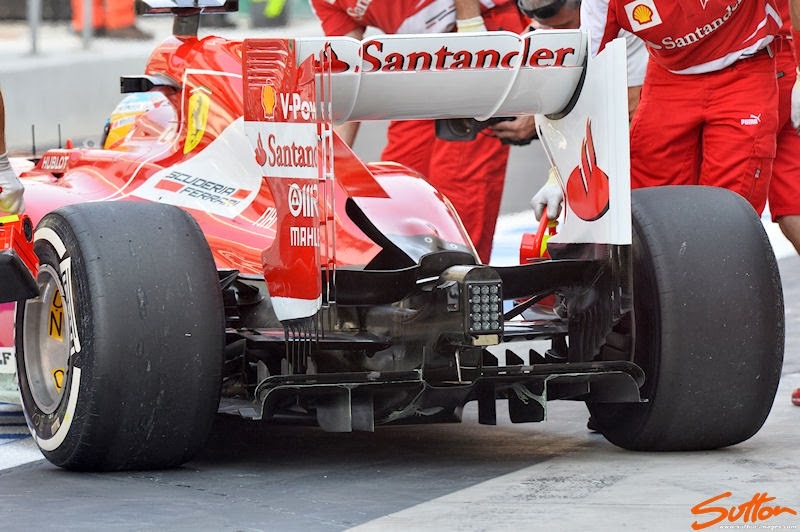 Unlike the slots used by other teams the ones on the F138 are placed right on the leading edge of the Endplate and run ¾ the length of it. The team also toyed with increasing the strakes at the base of the Endplate as they have in the past to 9 rather than 8. 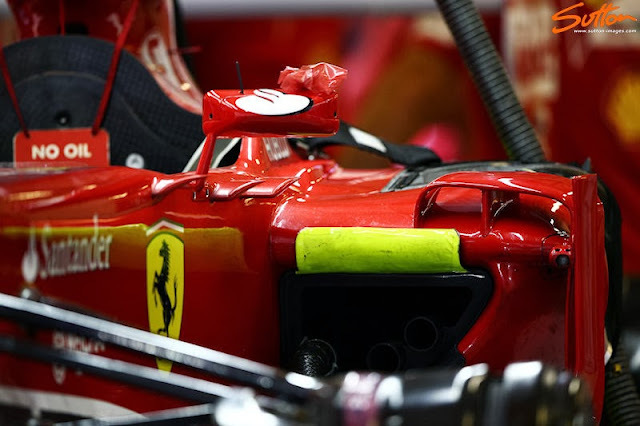 Unable to extract performance from parts bought to the track seems to be a trait the team have become accustomed to this season, for Abu Dhabi the team arrived with a new set of Sidepod Airflow Conditioners akin to those used by the team in Montreal and then abandoned. 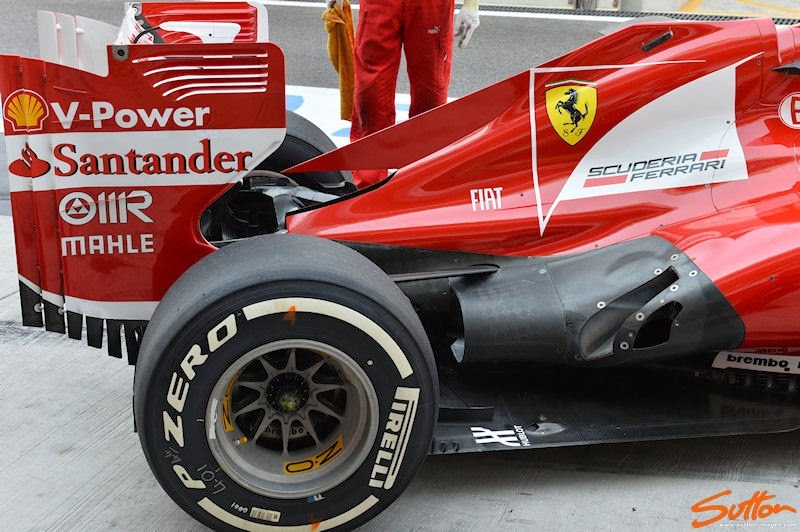 Either failing to meet expectations or perhaps part of their 2014 development the team didn't run them beyond FP1 & 2. Lotus have obviously been grabbing the headlines for all the wrong reasons for the last few races but in terms of the technical aspect, there is still much to talk about. 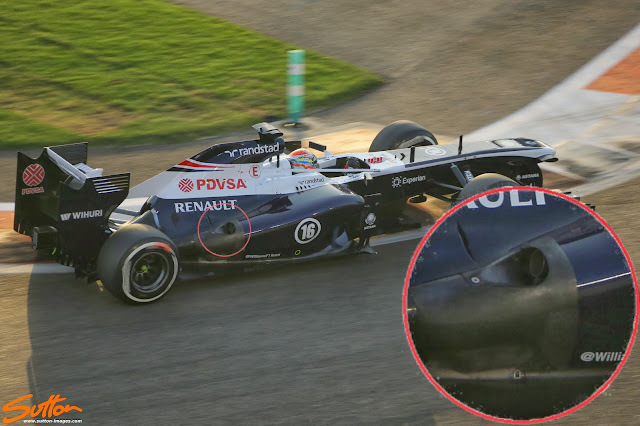 For India the team revised the Vortex Generators above the Sidepod inlet shortening them in height and twisting the outer two of the three. 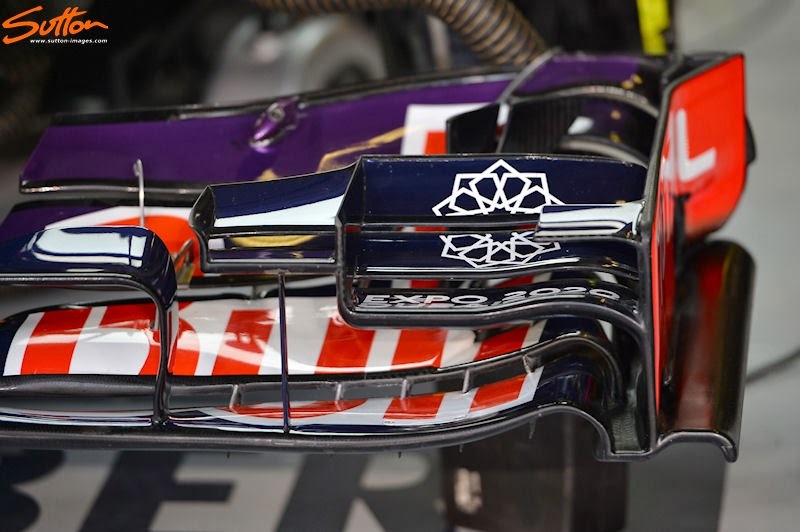 In India the team also tested an increased number of rear wing endplate strakes but decided to run their usual endplates. The Endplates featuring more strakes however made a return to Kimi's setup who also returned to using the Short Wheel Base E21 in Abu Dhabi. The Finn had struggled with the transition to the longer wheel base car, this allied to his dislike of the change in Pirelli tyre construction has totted up to some disappointing results of late. The development of the LWB E21 was born from work carried out in the teams simulator and suggestions made by the vehicle dynamics department. This of course is an area that Kimi has always excluded himself from over the years and so minuet changes that suit Romain might not suit Kimi. Furthermore Kimi has since his move to Ferrari was announced been ex-communicated from the team, unable to be privy to sensitive details pertaining to 2014 the team can't allow him to visit the factory etc. McLaren have their sets firmly set on 2014 as they have had for some time now, however the team are still trying to understand some of their errors in 2013. They tested a different position for the FOM camera housings briefly in India perhaps with the intention of learning something about their current package but moreover perhaps with an eye on 2014. 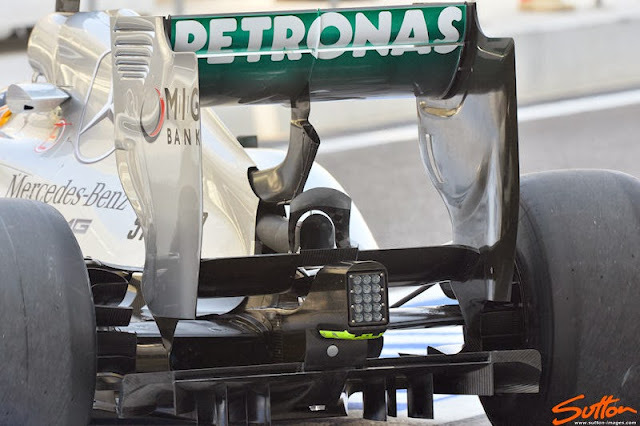 The FIA have realised that although their camera's are shaped to give aero neutrality inevitability the teams have found different ways in which to leverage an advantage. This advantage will be curtailed in 2014 (as I will discuss in the Nose section of my look at 2014) by prescribing where the camera's must be placed. McLaren usually position their FOM camera's between the front wing pylons looking to glean an advantage from the centralised portion of the mainplane. The test in India saw them place the camera's either side of the nosecone just ahead of the suspension. An incredibly frustrating season for the once great team who have found themselves struggling to stay with the midfield pack. 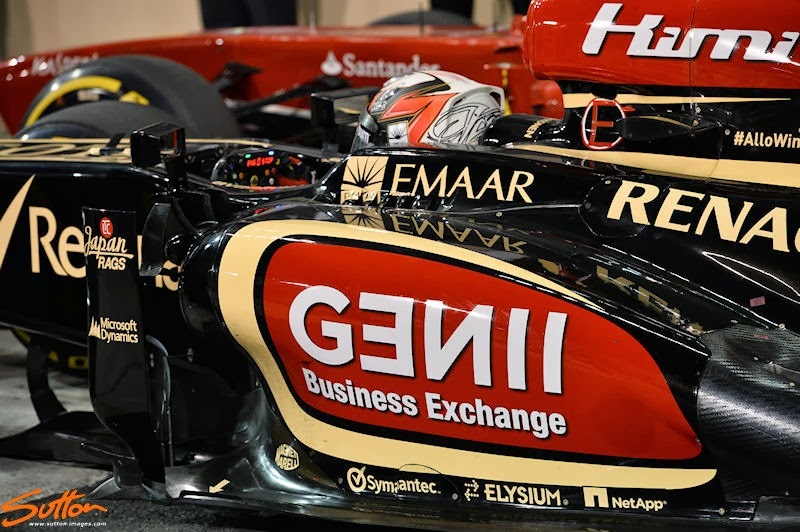 A stark contrast when we consider the victory that Pastor Maldonado took at Barcelona last season. Their problems this season have been systematic of the issues caused by their exhaust and for me I've been wondering for some time why they haven't made the switch back to a layout akin to their 2012 configuration. Although Williams trialled a 'Coanda' arrangement several times throughout 2012 they never actually ran it in race trim. This was for good reason too, the team were and still have been struggling to accurately model the 'Coanda' effect in CFD and the Wind Tunnel then ratify the results on track. An inconsistent exhaust plume trajectory during on and off throttle moments and during yaw result in a loss of downforce as the Diffuser loses efficiency. For Abu Dhabi the team arrived with some components that intended to simulate the loss of downforce that may be apparent in 2014. 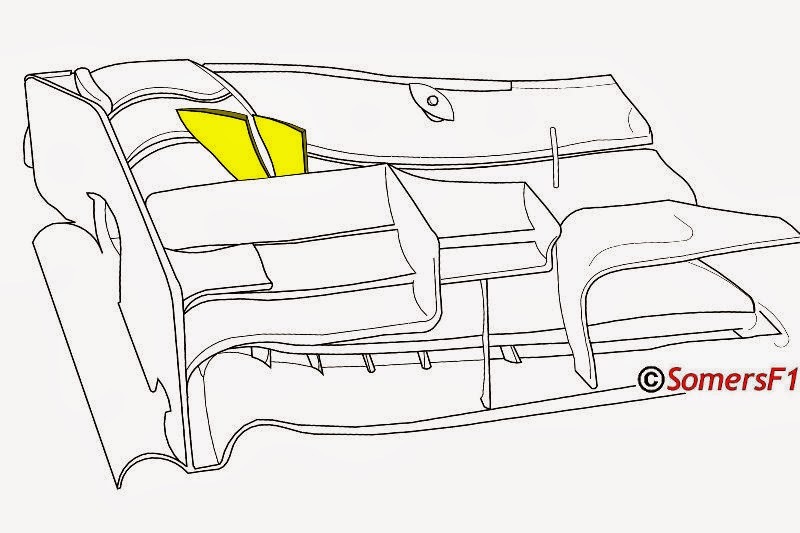 This was done by removing the Sidepods Vortex Generators and adjusting the trajectory of the exhaust with a new piece of bodywork. The result of the test actually convinced the team and drivers that they would actually be more consistent running the specification for the rest of the weekend. This is because since the beginning of 2013 the team have been managing the inconsistent performance of the Diffuser based on the smaller advantages it was giving them when the crescendo of airflow fell in the right place. The larger problem with this however is that you then end up also chasing and managing tyre life more closely as the surface of the tyre moves around as the driver tries to balance the loss/increase of downforce with the mechanical grip available to him. I'm quite sure the boys at Williams are rubbing their hands together knowing that all teams will have to abandon the chase for the best EBD in 2014. With the centreline exhaust and energy loss through turbo recovery of the exhaust plume making it almost a performance dead end, other area's will become critical in managing the Diffusers performance.